For the last eight weeks in Marketing and here on the site we’ve explored design as a way of thinking, as a way of creating and as a way of business. Today, we chat with someone who’s been there and done that in the design world, and is now inverting the gaze of his expertise onto his private life. Can the principles of design help us live better? 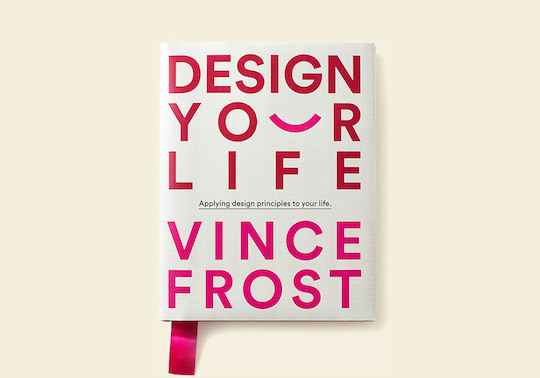 Internationally renowned Sydney-based designer Vince Frost, founder Frost Collective, is now the author of a kind-of self-help book, Design Your Life. 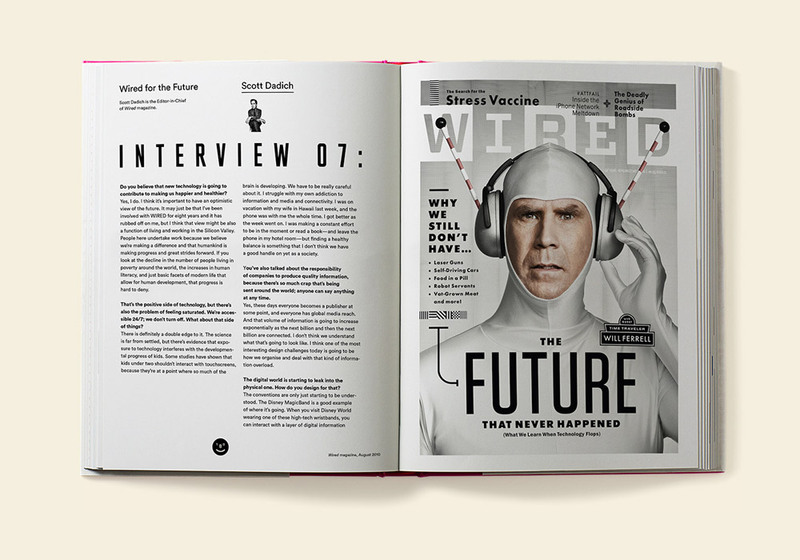 Marketing asks Vince Frost how the principles of design apply to life. Marketing: How did the book come about? Vince Frost: I’ve always questioned everything my whole life and wanted to make things better. Like a lot of people I worked very long hours, was very focused on my career and developing that, to help out clients, be the best that I can be, et cetera. By doing that over the years, I realised that I put my own personal health and life very much second to my career. Time happens and you work hard and long hours, your body gives you a warning sign that says ‘slow down’. I hit the wall a few times and had what I call ‘man flu’ a couple times a year and found it harder to bounce back and decided to look at my life and how I could redesign, how I could give it the focus that it deserves and how I could possibly use the design principles that we use in our everyday work – that dedication to solving problems and working out what’s right for me. That worked, as it would once you just put that kind of focus on it. It’s interesting when you’re working on a project, we’re relentless at trying to solve people’s problems, but when it comes to our own we get distracted or it’s too hard or we get the wrong advice or we don’t think we have the time to do so. In 2011 I did a talk at the Apple Store in Sydney and I decided not to do it just on work, which is what we normally talk about, projects. I decided to interweave that in my own life and the whole premise was ‘design a better life’, some key pointers on how to live lighter, be more positive, et cetera, et cetera. M: So when you do step back and think about design within a really broad context, not just the work you do whether it’s visual design or whatever, but you have an overarching definition of design that sums it up for you? 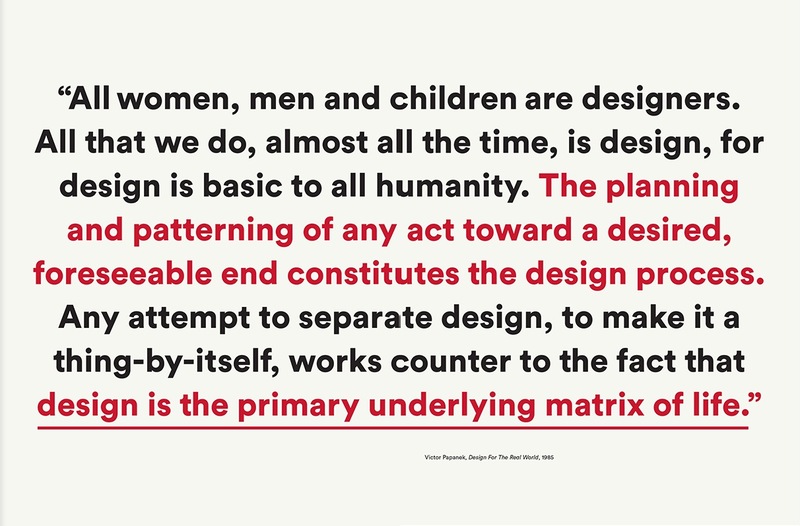 I think that sums up for me because he believes, and I believe, that everybody is a designer. Any act of trying to improve things or do something is an act of design. I think that’s really beautifully summed up in that quote. It sums up the premise that it’s not just about graphic design or product design or interior design. The fact is that anything that involves a thought process, looking at an opportunity and trying to improve on it or trying to find an idea or solution is an act of design. I talk to many people and interrogate a problem before I find the solution that’s going to be the one… the solution to the problem, the only idea, the ultimate idea for each problem. I was looking for that in myself, my well-being, my diet, how I live and where I live, how I am in my relationships. The act of being positive versus negative, this focus on saying ‘yes’ versus ‘no’. Some of them I already had, and for me it’s realising how critical they are for me. I other things I needed to discover that were very helpful for improving the quality of my life. M: When you apply design principles to things that you wouldn’t necessarily think about at first, is it strange or do you find that some people do it already though they just don’t realise? VF: I think the thing is is that people don’t give it the time that it obviously deserves. I guess the fundamental difference is when someone comes to you with a brief and there’s fees involved, there’s money, it’s a job. There’s a time limit, there’s a cut-off point. In our everyday lives, those deadlines don’t really exist, unless there’s some critical issue: you’re seriously sick or you’re about to be evicted or you just lost your job. It’s not until life gives you those very serious deadlines that you take life very seriously, and I know that when my doctor said, ‘Your cholesterol’s sky high… If you don’t do something about it, you could be dead in five years’. I don’t know how accurate he was, I’m not dead, but I took him very seriously. I’ve ignored it too long. I need to now act on redesigning my diet, redesigning things around me, exercising and all that stuff to ensure that I can kind of turn that situation around. Luckily I was able to do that. Some people obviously have things that they cannot turn around. But what I’m trying to say is that I think somehow you need to find a way to kind of tackling these issues and problems or opportunities at times that are less life-threatening and less critical. Pace yourself, incrementally change and evolve yourself to life, not wait until you hit a wall like most of us do. M: Similarly to commercial design, it requires discipline and skill? VF: Yes, it does. It does need that. Like with ‘agile’ work in the websites, et cetera. People can often think they need to lose 20 stone in three months because they have a holiday coming up or a wedding or something. They think about it as this huge task that they have to tackle versus the idea of maintenance and maintaining or improving the quality of their life incrementally. M: Who do you see as the audience for this book? Who did you write it for? VF: The audience was not aimed at designers, although other designers will find it appealing because there are stories in there about experiences I’ve had. Typographically, a lot of designers seem to like the layout, style, et cetera. But I really loved it when I bumped into some friends yesterday and they said they love it and it helped them, and they’ve recommended it to another friend who’s a banker. For me, that was what it was all about. I want to focus on how do I continue to expand on the book. I’m looking at different ways of pursuing that this year. Interestingly, a law firm bought a copy for each of their staff prior to Christmas which was very cool. It is a self-help book, basically, that’s what it is. 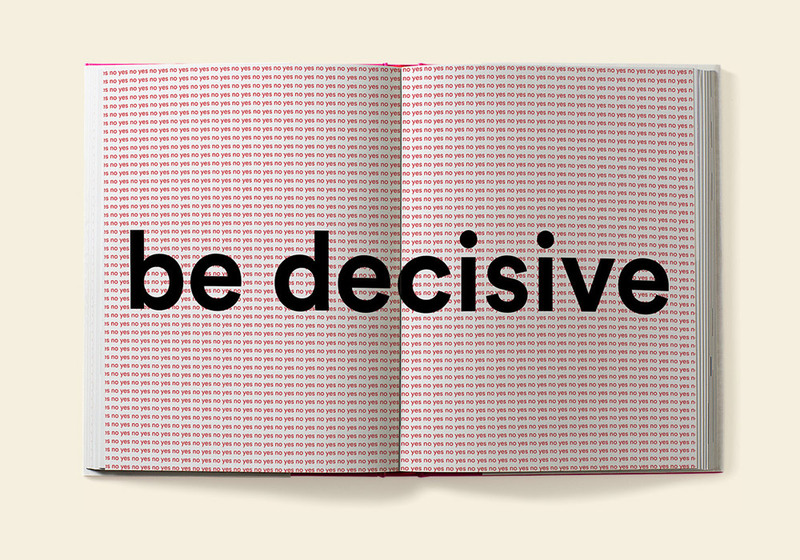 It’s not a design book. M: You feature some people through interviews and the like from some pretty diverse fields, like an editor of Wired, business people. What does say, was it your plan right from the start to get a diverse range of people or did you find along the way that you had some interesting tangents? VF: No, there’s a couple of designers in there, but I wanted to make sure that it wasn’t a whole bunch of designers. I wanted to have a cross-section of people that I know and who I respect who are in diverse jobs, and who were open to being open. I thought that it’s interesting how many of them haven’t really designed their lives and some of them don’t even think it’s possible to do so. It highlights for me the fact that many people put their own personal lives on hold, on the shelf. M: That law firm you mentioned before got me thinking about the workplace applications – obviously work and personal life is very much intertwined, but what are some of the productivity or workplace applications in this field? VF: I think that company were focusing on the idea of staff thinking more creatively, to own it and to take responsibility, to not be blaming other people. In some companies that is rife… blaming everybody, terrible politics going on within organisations. I’m not saying it is within that organisation, but there’s always something going on. This comes from a very caring perspective from this person who instigated buying the books for the team – she really cares about their well-being, not just in the workplace but in their everyday life. I think that’s really great that someone at that level understands and values that there is very little between work, life, family. You are one human being and how can you be the best you could possibly be? What are the ways, what the insights, the clues, the ways of being that can help individuals be better at what they do in their job? And also in their everyday life and the happiness and fulfilment in their collaborative approach of things? Again, people look at designers as creatives, but everybody is creative deep down, everybody has a creative ability within them. For most people it’s been trained out of them. M: Thanks, really interesting, and it’s a beautiful book, Vince, appreciate your time. VF: Thank you very much. Appreciate that. It’s been a fun project to do. All images courtesy Penguin Books Australia and Vince Frost.